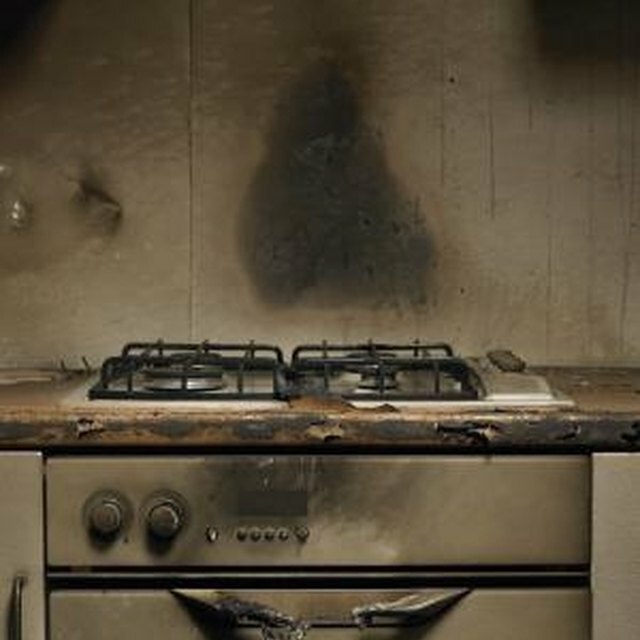 Smoke damage caused by house fires can be one of the hardest things to clean up. It seems to stick to everything, and getting rid of it is not easily done. In fact, sometimes homeowners must call in professionals because they simply cannot get the stubborn stains out of carpets, off of walls and off of floor tiles. After a fire, you will probably be anxious to enter your home to assess the damage and begin cleanup. Make sure that you get permission from the fire department before you enter the dwelling. Once you are granted permission, make sure you contact your insurance agency immediately. Someone at the agency should be able to give you advice on replacement or restoration of damaged items. In addition, the agency may be able to refer you to a professional fire restorer. Fire restorers specialize in helping clients determine how to prevent further damage, in addition to providing estimates for cleaning and deodorizing your home. They can also provide an assessment of what in your home can be refurbished. Regardless of how tempting it might be, make sure that you follow these rules when attempting to clean damage left by smoke. Do not try to wash flat or wallpapered walls without first consulting a professional cleaner. Incorrect cleaning can smudge soot and make the problem worse; don't try to clean upholstered furniture or carpets; check all electrical appliances that came in contact with water or fire before you attempt to use them; if the ceiling is wet, don't use fixtures such as lights or fans, as short-circuiting can occur. Removing smoke from a home can be a difficult task. Not only does it damage walls, carpeting and furniture, but it can also permeate other surfaces and flow through household ducts where it often becomes trapped. If the smoke is not properly removed, odors will resurface every now and then, especially if the weather is damp or warm Thermal fogging is a a way to get rid of stubborn smoke odors. It is basically a chemical fog that penetrates your walls and home, much like the fire did. As it penetrates these surfaces, odors are removed. Any insulation that can be replaced should be, and ducts should be cleaned out, as well. Smoke can damage a variety of things that you've probably never thought about. In addition to walls, furniture and carpets being damaged, food packages can also become contaminated. In addition, your refrigerator can also fall prey to the effects of smoke damage. You should clean out your refrigerator and freezer and leave the doors open to air it out Clothes may also become damaged by smoke, even if the damage is not visible. Smoke can stick to clothing, causing musty odors when worn. Make sure you have them professionally dry cleaned to remove unwanted odors Etching on porcelain bath fixtures can also become a problem. In addition, house plants can become coated with smoke residue, so it's best to wipe them down. When cleaning plaster walls, do not use water-based cleaners. Using such cleaners can cause the smoke stain to bleed into the walls. Instead, go to a cleaning supply store and purchase a chemical sponge to remove soot stains from walls. If you can't find a sponge, then you might want to try rubbing alcohol or paint thinner. Always use rubber gloves when using cleaning agents and make sure that the room is well ventilated. Open a window or use an electric fan to make sure fumes don't stick around. What Are the Causes of What Looks Like a Burn on the Wall of My Microwave? How Often Should You Repaint Your Walls? Is Carpet Cleaning Safe for Babies? How Does Mold in the Walls of Your House Affect Your Health?